Project obstacles and solutions: The golf course at Culver Military Academy is a private facility for the use of students, faculty and alumni. It was first opened in 1924 as a 9 hole course, with sights set on opening another 9 holes at a later date (and possibly a 27 hole course according to the original plans.) However, the Great Depression squelched these plans, as money was not available to maintain the original 9 holes. This was followed by WWII and rationing of gasoline that restricted the mowing of the course. After the war, the golf course was refurbished to be used again. However, the bunkers were left with grass growing in them rather than sand. Fast forward to 2014 when Culver decided to rebuild the bunkers and restore the course to its original plans. IMI Aggregates was contacted to supply base gravel for drainage and sand for the bunkers. Bobby Weed Golf Design was brought in as a design consultant and Total Turf Golf Services was hired to rebuild the bunkers. IMI geologists and QC worked to come up with a gradation of fine aggregates to meet the specifications. IMI produces bunker sand to USGA specifications for gradation. The consultant wanted a somewhat tighter sand gradation than the normal particle range allowed ​in​ the USGA recommendation. IMI produced a new blend to accommodate these specs. Samples of the bunker sand blends were sent to Bobby Weed's labs for testing. IMI QC did their own internal tests on each load before shipping it to Culver. 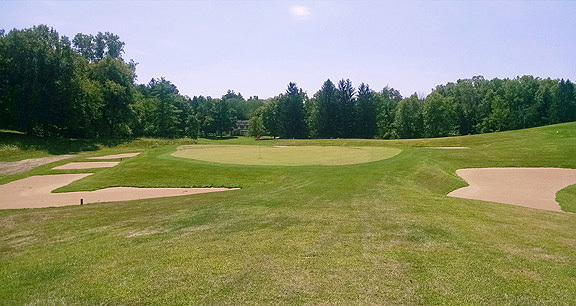 The Culver Academies Golf Club re-opened in the summer of 2014 rebuilt to the original design. IMI supplied 3,000 tons of bunker sand for this project. For more information on golf products from IMI, click here.